Trying to keep your garden, yard or patio tidy can be difficult enough, but when leaves, brush and other debris add to the problem, what can you do? The simple answer is to use one of the best cordless leaf blowers, to quickly and effortlessly remove them. Cordless leaf blowers are a very effective way to clear your garden or pathway of leaves and other debris, but before buying one there are several aspects of them that you need to weight up. The most obvious reason for this is that each leaf blower will have different specifications, and the features may differ. You may also benefit from having a fuller understanding of how leaf blowers should be used, both in terms of operating them, and in relation to the safety precautions you should be taking when operating one. While the main purpose of a cordless leaf blower will be to clear leaves from your lawn, yard, patio, decking or pathways, they have several uses that you may not have thought of. During hot, dry summers there is bound to be a lot of dust around which may settle outside your house and on your car. A leaf blower is great way to shift the dust to clean up, and in the case of your car, removing dust can reduce the chance of it causing minute scratches. A leaf blower can dispel water that may have formed puddles on your patio or path, and it is also a great way to blow snow away from doorways, or from your car windscreen before you start a journey. Following a heavy snowfall, it can be used to clear your driveway too. Nearly all cordless leaf blowers use a lithium-ion battery to power them. This obviously means that the length of time that you can use them in one session is limited by the battery life. You should expect any decent leaf blower battery to give you at least 20 minutes, with the better ones going for 40 minutes or more. While 20 minutes may not seem like a very long time, unless you have a massive yard, the task of clearing leaves in this way should be no more than a 10-15 minute job in most cases. The time it takes to charge the battery can vary considerably as some have quick charge options and others don’t. On average it should be around 1 to 2 hours for most batteries. One of the biggest frustrations that many buyers have, is their leaf blower product arrives without a battery, or without a charger, or without both. This is not a case of the supplier forgetting to package them, but because these tools are sold without them. It should state this in the product description, albeit it is not always very prominent. With this in mind, when you are assessing each leaf blower, look carefully to see where in the description it tells you what is, or isn’t included. Where a battery or charger are not included these will need to be purchased separately. You might not think that a product as simple as a leaf blower would create any possible dangers, but it can, and not just to the person using it. Since a strong jet of air is blowing all sorts of debris around, and up into the air, there is a risk to you, and anyone close by, of a piece of this debris going into the eye. The first action you should take is to switch off your leaf blower whenever someone walks towards you. More prevalent for the safety of your own eyes is wearing safety googles whenever you use the blower. The noise created by a leaf blower is significant, to the extent they are even banned in some parts of the country. Regardless of where you live, it might be worth checking the local regulations in relation to noise from garden tools before you use your leaf blower. Beyond this, it is highly recommended that you wear ear protectors whilst using a leaf blower. You should know by now that you can use a leaf blower for multiple purposes, which is fine, but what makes it even more adaptable is when you are able to use it at different speeds too. 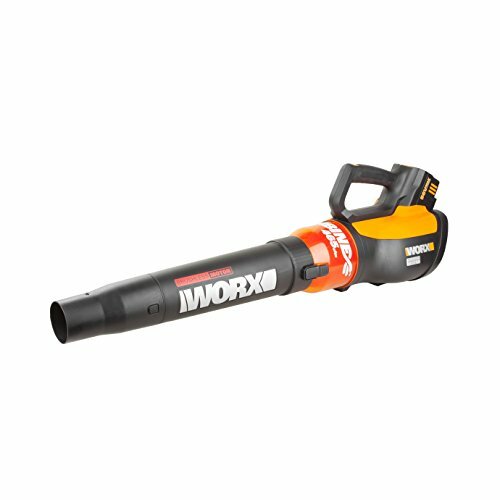 With this leaf blower from Worx, that is exactly what you get. It has variable speeds, so you can set it according to the job you are doing and the debris you are clearing. If this involves clearing a large volume of leaves, including those that might be stubborn due to being wet, then the top speed Turbo setting of up to 465 cfm will give you that boost of air to help clear them. While it is not the lightest blower on the market at 9 lbs., one of the important features of this leaf blower is how its weight is evenly distributed and balanced across the tool. This means carrying and using it do not put too much strain on your hand or wrist. The handle is ergonomically designed so it feels comfortable in your hand throughout the clearing work. Once you have finished, instead of just leaving your blower on the garage or shed floor, it can be hung up with the handy loop which is built into the handle section. Unlike many cordless leaf blowers, this one comes with the battery and charger included, which is more convenient, and it saves you money, as you do not need purchase these separately. Charging time is normally around 90 mins, and on a full charge, you should get at least 30 minutes of usage. Bear in mind when you ramp it up to the turbo setting, this time will be reduced. While they may not be the heaviest or largest garden tool you’ll ever use, the fact that you must carry them, and move the nozzle continuously, has the potential to put some strain on your wrist and arm. 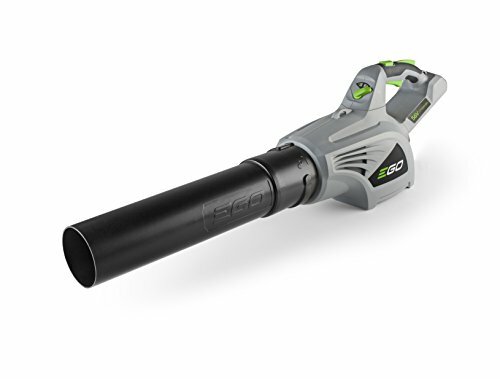 That should not be a problem with this cordless leaf blower from Ego, as it weighs a mere 5.1 lbs., making it one of the lightest blowers we have tested. Even if the weight isn’t an issue, the vibration generated by leaf blowers can cause you discomfort; however, Ego’s technology should have that covered too. The motor inside is brushless and extremely efficient, which means the amount of vibration it generates is minimized. This type of motor also tends to have a longer lifespan so there should be no issue in terms of the number of years your blower lasts. Even if a problem were to arise, you can rest easy knowing that you have a 5-year manufacturer’s warranty to fall back on. The blowing power from this tool is impressive, and when you select turbo boost the turbine fan can produce up to 480 cfm. Of course, you might not always need it to blow that strongly, which is where the adjustable speed control comes into play. You can set the speed between 250 and the maximum depending on the task at hand. Other important features include the blower being weather resistant which helps prolong its life, and the low noise rating of 65dB which should keep it within regulatory limits. 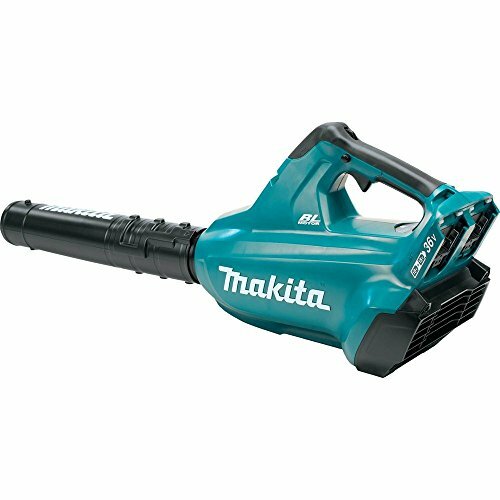 While the batteries and charger are not included with this leaf blower from Makita, when you obtain them you should be impressed by how long they will power the tool for when fully charged. You should expect at least 30 minutes, which is good for this type of tool. One other feature of the batteries is they are interchangeable with other Makita cordless tools. Being able to control the power of the airflow from a leaf blower is useful, as it is not always the case you need full power. 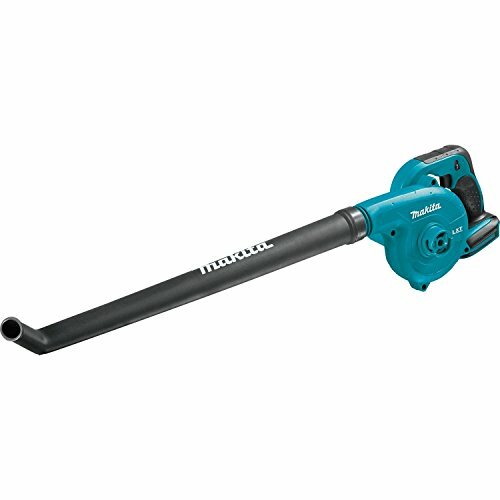 This Makita blower has variable speed control which is simple to operate, as it sits exactly where your thumb will be when holding the blower. There are 6 different settings, with the maximum being an impressive 473 cfm, or 120 mph, if you prefer to measure it that way. As well as the speed control, the on/off trigger is housed within the handle, which is ergonomically designed, although we didn’t like the fact that you must continually hold the trigger in for the blower to run. Nevertheless, it is a reasonable weight of just 8.4 lbs., and it feels balanced as well, which helps eliminate any strain on your wrist. Your well-being is also a factor in the brushless motor design which has a very low noise rating for a leaf blower of just 60.2dB. While we still recommend you wear ear protectors, this is a level which some leaf blower manufacturers can only dream of. Further elements of the machine’s design contribute to this lower noise level, such as the 3-blade fan, double housing for the motor and sponges which dampen both the sound and the vibration levels. We’ll be up front and say that this leaf blower is not going to win any awards for its air output; however, it is not every gardener who needs turbo power. Often a light, simple leaf blower is enough, and if that is what you need, then you really should take a closer look at this blower from Earthwise. We mentioned it being light, and this really does get close to the ‘as a feather’ category, given that it weighs only 3.6 lbs. This should make it feasible for just about anyone to use it. While holding it you will also benefit from the rubber cushioning within the handle, which makes it more comfortable as it absorbs some of the vibration. The battery and charger are included, which we something we cannot say about every leaf blower we have reviewed. Another positive is that the battery can be fully charged within 60 minutes, thus saving time compared to those that take 90 to 120 minutes. From that full charge, you can expect to have around 20 minutes of leaf blowing time, which is normally enough for most jobs. Admittedly the airflow doesn’t compete with some of the more powerful blowers, but even at 73 cfm, the air still comes out at 130 mph. This should be enough for most general leaf blowing jobs around the outside of your home and in your yard. Helping this is the tapered nozzle which focuses that airflow and allows you to get the blower into more awkward spots. Very lightweight – Just 3.6 lbs. This is another cordless leaf blower that will appeal to those who want a tool which is lightweight and easy to maneuver. Without the battery, it weighs an astonishing 1.75 lbs., and even when you attach a battery, it is only 4.3 lbs. This still makes it one of the lighter leaf blowers available and should prove to be very easy to move around as you are using it. We mentioned attaching a battery, which unfortunately you will need to purchase separately, along with a charger. From a full charge of a Makita battery, you can expect 18-20 minutes of usage time, which is normally enough to clear the front and back yards of most homes. The air power is a respectable 91 cfm and 116 mph, which are generated from the blower’s 18,000 rpm motor. The speed can be set to any one of three different levels using the simple switch which is housed in the handle. The handle has rubber cushioning to help make it feel more comfortable when the blower is switched on. One feature of this leaf blower which gives it an advantage over others, is the length of its nozzle. Some blowers have very short nozzles which means the user must bend down a lot to get the airflow close to the leaves. This can often cause discomfort and even back strain. With a longer nozzle, such as the one on this blower, you can reach leaves on the ground without bending over. The curved end of the nozzle also allows you to reach more difficult to reach spots that normal nozzles can’t get close to. When it comes to getting rid of those stubborn leaves that simply won’t budge, you need a leaf blower that can blast out a powerful jet of air, and that is what this Ego Power+ model can do. Its turbo setting can produce up to 530 cfm, which puts it up at the top of the power league of the cordless leaf blowers we have tried. Of course, you won’t always need to go blasting at debris every time, and this is where the adjustable speed control becomes useful. Instead of turbo speed, you can set it as low as 250 cfm, for slower, and quieter airflow, although at the lower speeds there is more likely to be debris and leaves that won’t shift. Unfortunately, one of the prices you must pay for the very high power is a heavier machine. Without the battery, it weighs 13.6 lbs. and the overall weight is likely to rise above 16 lbs. depending on what battery pack you use. Despite its weight, the blower should still feel comfortable, as it has been designed so that it is balanced when being held. The other design features include the machine being weather resistant, so even if you are out blowing leaves in the middle of the rainy season, it will not adversely affect this tool. The brushless motor is very efficient, and it will require very little maintenance because of this. This type of motor is also quieter and tends to last longer than other types. Bear in mind that you will need to purchase the battery and charger separately. We had quite an array of cordless leaf blowers to review, with lots of differences in weights and power outputs. 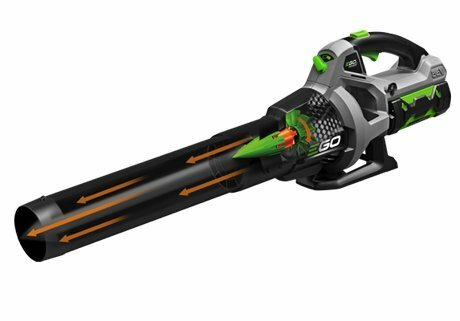 The one that stood out for us and gets the award for best cordless leaf blower, is the Worx Turbine Cordless Leaf Blower. This has variable speeds to make it useful for all sorts of clearing jobs, with the ability to blast out 465 cfm on its turbo setting, if needed. It weighs only 8.1 lbs. so it should be light enough for most people to be comfortable using it, and it can be used in all conditions, thanks to its weather resistant design. Finally, the battery and charger are included which is always a big plus for us.